In 2015, the office of Professional Studies at John Jay College spearheaded a pilot program called Crisis Intervention Team (CIT) training, along with faculty clinicians from our Psychology department to train 550 officers in the New York City Police Department in communication and de-escalation skills when dealing with people with mental disorders, and those in emotional crises. The delivery of the training was highly innovative, incorporating adult learning principles of experiential learning. The model used a stage production with professional actors to portray individuals in crisis based on real-life scenarios that officers encounter on a daily basis. The trainers would observe how the interaction was playing out, pause the scenario to discuss the positives and negatives, and provide feedback to help the officers reach a positive outcome for a successful de-escalation in real time. The success of the pilot training led to a statewide recognition for non-credit program development by the Continuing Education Association of New York, for the creative approach in delivery, and the high impact the training has in serving the community at large. To date, 8,200 NYPD officers have been trained in CIT. Professional Studies continues to improve the training in response to current trends in mental health awareness and criminal justice reform, and has further customized the training to other law enforcement agencies with over 2,000 recruits and officers trained in the Department of Corrections and over 100 investigators from the Department of Investigations. The collaborative efforts have also provided the opportunity to contribute to the 2018 revision of the New York State Basic Course for Police Officers in mental illness instruction, entitled Fundamental Crisis Intervention Skills for Law Enforcement. It has become the exemplary training manual for all police recruitment agencies in New York State. The success of the training program is garnering attention internationally as well. 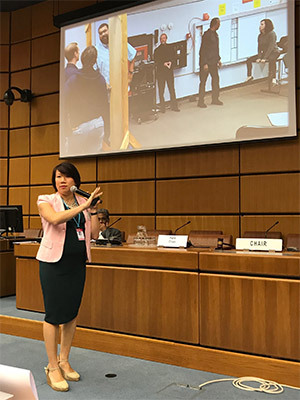 Director Chan was invited to deliver a keynote at the United Nations Office of Drug and Crime in Vienna in August 2018, for the International Police Executive Symposium on the innovative approach to training law enforcement to handle mental illnesses. Police practitioners, academics as well as UN officials from over 40 nations were in attendance to learn about John Jay’s training model and open channels for potential international collaboration.